This amazing festival attracts thousands of people worldwide and offers many great performances. 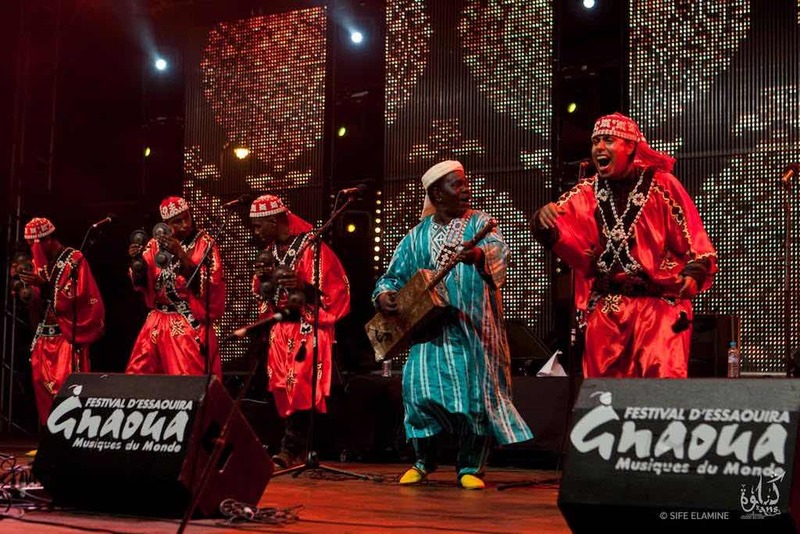 The Gnaoua music festival celebrates the Gnaoua heritage and draws the world’s greatest jazz artists to perform in this wonderful town that is loaded with history. This is a wonderful 4-day event that offers exhibitions of art and the unique Gnaoua music and entertainment sounds. International musicians come from Tangier, Marrakesh, and in Essaouira to perform their Gnaoua compositions at the Place Moulay Hassan, and other areas in the Medina (old town). 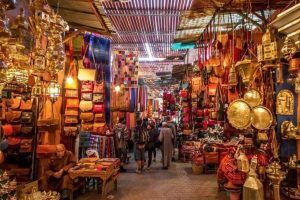 They also perform outside the city including the Marche Aux Grain, Chez Kebin, Bab Doukkala, Zaouia Gnaoua, Bab Marrakech, Place Khayma, and others. Bab Sebaa and The Moulay Hassan stages are strictly for well-known groups that have become enormously famous. Recently, the festival honoured the Gnaoua musicians at the new stage at Bab Doukkala. This is a wonderful opportunity for die-hard fans to meet stars and enjoy their brilliant music. This stage was built for Gnaoua concerts only, along with the traditional ‘”lilas” and Gnaoua Zaouia trance performances. These unique performances take place after midnight and are only for the most devout of followers. On the smaller stages in Medina, fans who are interested in music that fits many different dances including the Argentine tango, hip-hop, jazz and also contemporary Moroccan music now have two new stages – The Pepsi, and the Méditel. These environments are perfect for the newer generation performers and are enjoyed by thousands of people each year. The Gnaoua Festival has 10 performing sites for everyone’s specific taste. There are 10 different parallel programs that are actually quite original to the festival and offers something for everyone. During the evening, the programs are broken down into two sections. The first is the Gnaoua musicians performances which take place between 6:00 and 9:00 pm. Once these performances are over, the audience will be entertained by the non-Gnaoua jazz musicians. 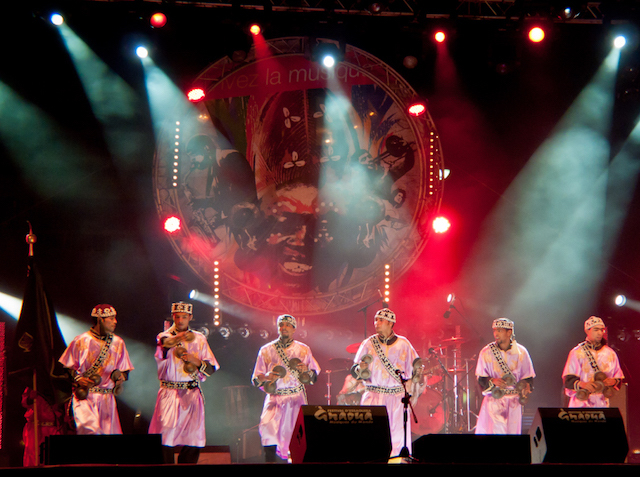 One of the most popular concerts is the Master Gnaoua bands that start performing at 11:00 pm. They use stringed-instruments that include both bowed lutes and plucked lutes known as gogos and gimbris. Also, there is a stringed instrument, the hajhouj, which gives their music a much-needed bass quality. The hajhouj is a guitar that is similar to the American banjo and is known as a “brushless drop-thumb frailing”. Literally, the thumb plucks or drops to create a certain pattern that reflects through the vibration of the strings while other fingers on the hand create other styles of sound by drumming. This instrument dates back to the West African lute known as the Hausa. This instrument is the direct ancestor of the banjo. These performers also use large drums called ganga and huge iron castanets. The combination creates a lively, exhilarating sound that is loved by all. During the festival, the Maâlems will chant in Arabic or Gnaoui. Their message usually focuses on the spiritual that is believed to have healing powers. The songs and musical instruments are said to place the audience into a trance and, in turn, they begin to sway. Around 12:00 and 2:00 am, there is a blend of spiritual Gnaoua music and non-Gnaoua jazz performing American and European rock, and African blues. Great musicians from all around have been performing at this festival since 1988. Some of these artists include Trio Joubran and bluesman Justin Adams, and many others. Gnaoua music is a wonderful blend of African, Berber, and Arabic spiritual works. These performances include music, dancing, and singing. Gnaoua is said to be a celebration of life along with prayer. Although there are many factors that have influenced this style of music, it can be traced back to sub-Saharan, Africa, and the Western Sahel. It is practice mostly in North Africa. The Gnaouas are the direct descendants of black slaves from Mali, Guinea, and Ghana who were enslaved and taken to serve as the guards to the Moroccan sultans. 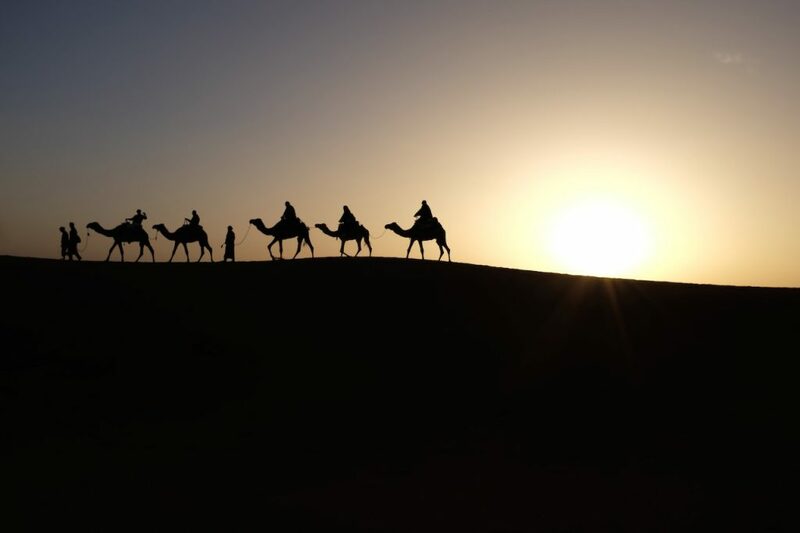 Legend has it that Bilal healed Fatima, daughter of Mohammad, by singing to her. Due to this phenomenon, eventually, their titles were changed from guards to “doctors” who could mend souls. They were known to blend African their traditions with Islamic folklore during their trances. These trances were known as “Lilas” and are conducted during the late hours of night. The chanting continues on through the night hours and includes dancing, chanting, and other ceremonies. The purpose is to force the spirits within someone’s body to heal their soul. Gnaoua songs are usually very long, lasting approximately 20 minutes up to several hours and they will continually repeat one sentence over and over. For those not familiar with this kind of performance, they might think it’s just one very long song when in actuality it’s a spiritual chant. Within a 20 minute chant, there can be a series of songs or chants. These songs are meant to bring about trances which is why they go on for such a long time. The Issawa of the Hamadsha believes they have the spiritual abilities as that of saints. In the Arabic language, they start their ceremonies by reciting the works of saints. 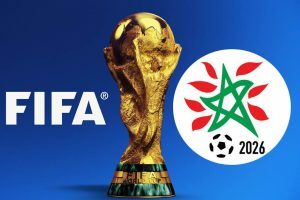 They believe they can announce their standings as the spiritual descendants of saints and therefore should perform these sacred rituals. Gnaoua’s ancestors were not native speakers of Arabic, so they would begin their Lilas using songs and dances. They believe they are re-living what their slave ancestors felt and realize how they found redemption in the end. 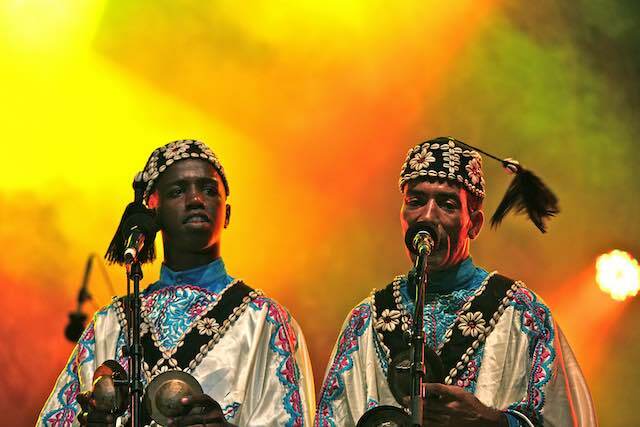 The Gnaoua Festival of Essaouira has forever changed the face of the original Gnaoua ritual music by combining spiritual music with other musical styles such as jazz, reggae, blues, and hip-hop. Musicians participate every year blending and sharing their own musical styles with Gnaoua music. This is one of the largest public festivals in Morocco and the most exciting jam sessions anywhere in the world.